“Do NOT challenge my map reading skills!” I barked at Boyfriend. I cast a furious glare over my shoulder from the bow of our canoe. 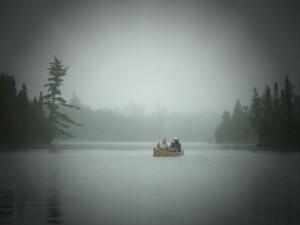 Possibly the toughest BWCA paddling day in terms of rain and headwind. 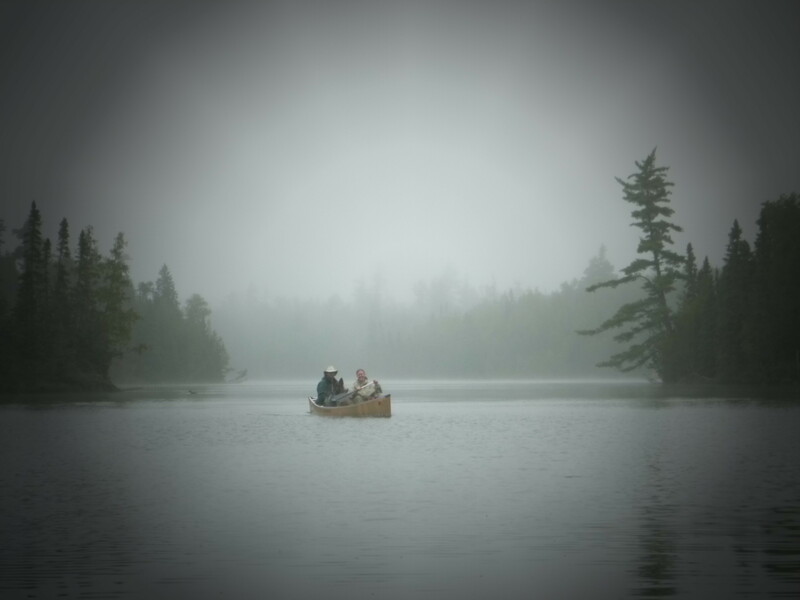 It was our 9th day of paddling in the BWCA. We’d spent hours struggling against a drizzly headwind on open water. We’d awkwardly sidestepped tension between the other couple on the trip. Then Boyfriend had the audacity to suggest that I had led us to the wrong location. Me. Me: the person in the group that has probably spent more time navigating wilderness than the three others combined. Me: the person with a deeply innate sense of direction. Me: the travel addict who has traversed more foreign cities, trails, and countries in the last five years than most people do in their lifetimes. EX-CUSE ME?! We are on #@$%ing Horseshoe Lake, god#@$^it, thank you very much, Mr. Know-It-All! I did NOT just lead us through the steepest portage we’ve conquered to the wrong lake, only to hand over the stern to a novice like you and be told that I’ve made a glaring error. AAARGGGH!! Or. *gulp* Have I? Is that patience flooding back into my body or remorse? Oopsie. I guess, now that I really look at the map, actually, we are on Jump Lake – a teeny puddle – which we will exit after just a few strokes down its length. 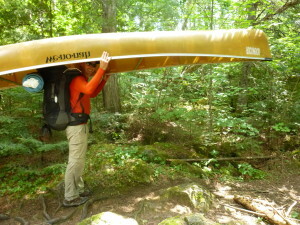 I guess the group will have to endure an additional two portages – the most punishing part of canoeing – along with me. I guess… I am… an… idiot. Sorry. Um… good job, Grasshopper. Not bad for a novice. I wish I could say that was the sum of my failings on the trip. But, no. By far our favorite camp meal – next time we come to the BWCA, we’re having chicken tacos every night! In my steam-rolling, take-the-bull-by-the-horns, solve-the-problem *now* way of doing things, I stepped up to the plate to get food organized for our BWCA (Boundary Waters Canoe Area) trip. No one else was doing it! I took to forums, gathering years of accumulated wisdom and settled on the iterations approach. Eating each meal three times meant buying and carrying less crap. It was the same for the snack roster – six items in quantities that allowed each person three indulgences per day. Thankfully, I wasn’t alone in my less-than-perfect-ness. Let me tell you that many things were said seethed between all four sets of clenched teeth at various points during our BWCA canoeing adventure. They say travel is the ultimate couples test. However, if you don’t have a few cool $Ks for an overseas trip, I think canoeing is an excellent substitute. We got our first opportunity to bond almost immediately. 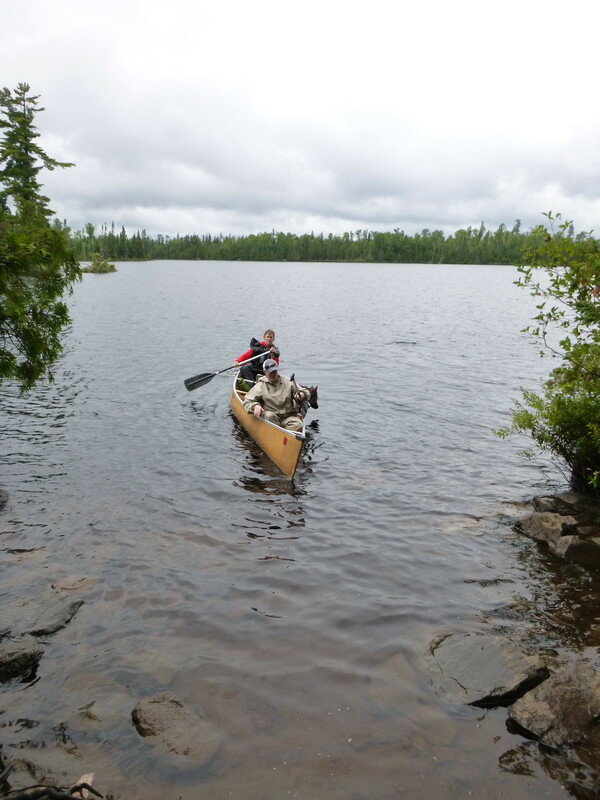 After paddling across Poplar Lake, we reached the beginning of the portage to Meeds. Portaging – if you didn’t know – is the four-letter word of the canoeing world, coming just after “Pretty sure we lost the paddle” and “I think the boat’s leaking.” It’s what you have to do in between exploring all the beautiful lakes of the BWCA (Boundary Waters Canoe Area). Basically, you put on a heavy, heavy pack containing your bed, house, stove, dishes, lights, tool box, clothing, toiletries, and all the food you need for days. Heck, throw in a fishing pole and tackle while you’re at it. Then you bend over and pick up a heavy and awkward object. If you’re really good, you manage to balance it on your shoulders with your head up inside the boat hull like it’s a paper bag. Otherwise, you pick up one end of the boat, your partner picks up the other, and you both allow it to swing repeatedly into your leg like your grandmother’s oversize suitcase at Christmas. 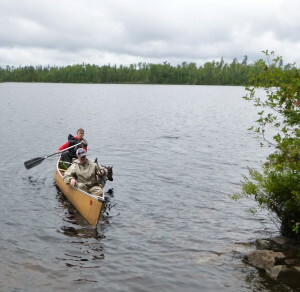 In the BWCA, the portages are often wet, muddy, rocky, slippery, and boggy. The few bridging planks offering respite from the muck are often overgrown, loose, or rotten. As a bonus, on our very first portage carrying packs that were the heaviest they would ever be and least-suited* to the occasion, we also had the joy of climbing over dozens of dead trees that had been blown down in a wind storm several days previous. *Duluth packs are advised – a style that allows the canoe to sit flush on the shoulders whereas modern backpacks often always get in the way. We quickly ate the words we’d uttered upon meeting our rental canoes (“Wow! These are actually pretty light!) and realized why permits for this entry point were still available when we were finally ready to reserve mid-summer. The boys agreed to take the first turns hauling the boats on their shoulders – a tandem carry seemed ridiculous with constant slips pulling both people off balance. My friend’s husband’s frustration split the air in a stream of four-letter expletives that filled the forest for miles around, echoing what we were all feeling. One of many manic moments tipping heavily in the direction of the heaviest canine. We spent the next ten days loading and unloading the boats, carrying them down trails, paddling around various BWCA lakes, and hoping to see wildlife. Our trip compatriots – my childhood hometown best-friend and her husband – brought their two lovely dogs. The biggest, the poor German shepherd, struggled to find a comfortable position in the small canoes, inadvertently causing the humans panic blips each time she suddenly shifted her rather large weight. Getting the dogs in and out of the boats was a comic routine as well, with lots of encouragement and urging often ending in physical assistance. The biggest dog also becomes neurotic when left alone – a fact that escaped consciousness when the men joined the women at their lake overlook on our first night in camp. The dogs had been zipped into the other couple’s tent. But mosquito netting and nylon is no match for a panicked beast. When the dogs arrived at the overlook, tails wagging, it sunk in that one of two tents – on the first day of a ten day trip into a wilderness notorious for mosquito infestations – was definitely damaged and possibly destroyed. Luckily, mad McGuyvering – made possible by my sewing kit and gauzy scarf – rendered the tent serviceable again. The other item repaired on the trip: our psyches. The great outdoors does wonders for the body and soul, in spite of (or perhaps because of?) all the challenges. We made up for months’ worth of crying and laughing that is easily lost to the minutiae of everyday life. When we weren’t enjoying the BWCA’s forests of cedars, peeling birch, alders, and maples, we were sunbathing in camp, reading books, and swimming in the lake. We slept in most mornings, then spent afternoons paddling around, fishing, and picking raspberries, salmon berries, and wild blueberries. We watched the chipmunks race up the trunks of hemlocks and white pines to torture and tease the dogs – especially poor Luna. As we roasted marshmallows over the fire at night, we listened to frogs chirp, wolves howl, and red-eyed loons emit their avian calls that sound like a tribal flute. Our day hikes and daily trips through the woods to the latrines almost always involved encounters with mushrooms that often looked like cartoons come alive. The latrines themselves were awesome. Despite the solitude we experienced, the BWCA is a heavily used area. Managers prevent disgusting and horrific human impact by digging open-air, pit latrines – complete with toilet seat! No walls, no toilet paper. Just a path leading into the woods. It’s up to you to work out a system with your camp mates to indicate whether or not the loo is occupied. We didn’t often use the other provided amenity – campfire grills. Boyfriend, back when we landed in America, bought a stove that I… didn’t love. I should add that it was part of a buying spree that I also… didn’t love. The stove seemed like a gimmick, using wood for fuel and featuring a usb charging output. I rolled my eyes. Then he smoked a pork tenderloin on it when we were in New Mexico, and my feelings toward the silly object softened. The stove won my whole-hearted vote when it meant we wouldn’t have to pack ten days’ worth of fuel on our trip of “carry-your-backpack-and-a-boat-too.” The USB charging light didn’t turn green until the third day: wood gathered in a temperate rainforest has a hard time producing the required heat. While we noted there wasn’t enough fuel to go around if everyone brought this type of stove, we still adored it. We cooked a few meals on the stove that earned top honors. 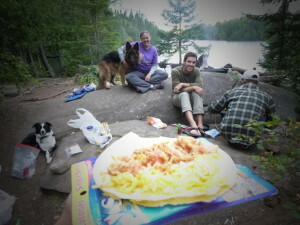 Chicken tacos – from foil packet chicken (no cans or glass containers are allowed in the BWCA) – was our number one meal, followed by a rice-veggie-corned beef stew. Our ten-ingredient oatmeal was both palatable and pervasive on the breakfast menu. Cheese, salami, and cracker lunches never made anyone sad. Our home baked treats – rice krispy bars and “everything-but-the” granola bars – were a daily highlight. Dry shelter and rainwater collector all in one. 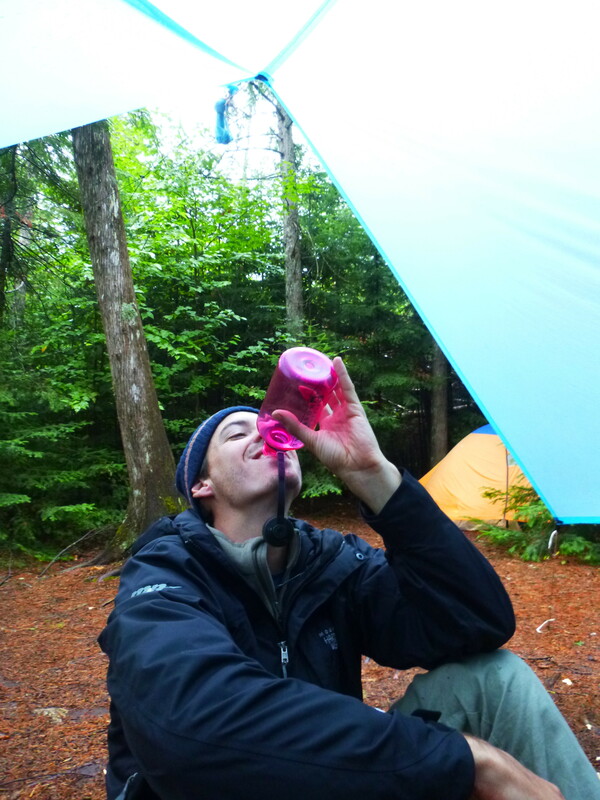 Wait… wasn’t the bourbon in the pink Nalgene? Of course, it wasn’t all roses. Our first full day in the BWCA had us eating lunch in a downpour – trying to scoop dry tuna onto even drier corn tortillas while huddling under the inadequate shelter of juvenile trees a very long way from camp. On our third day, our bear bag debate and worrying took the better part of an hour. On the last full day, my friend’s husband broke out his fresh blue jeans for the first time on the whole trip. 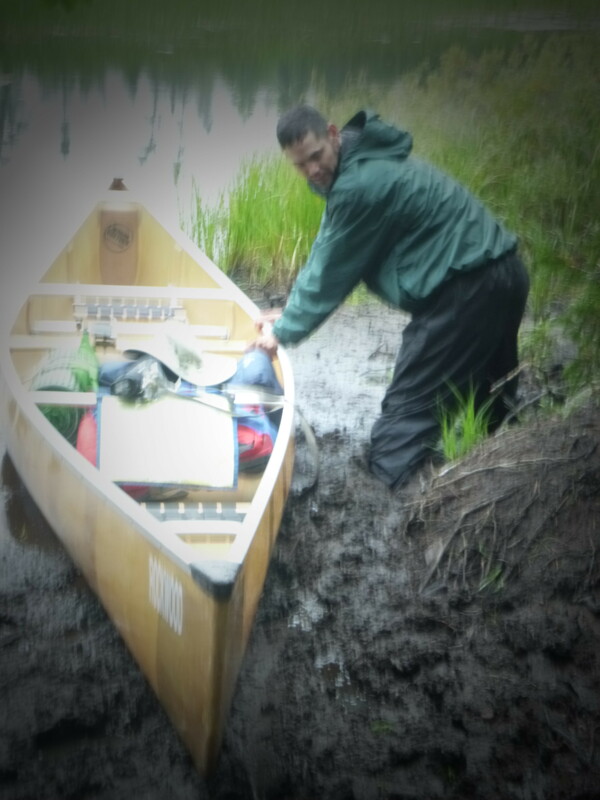 Hours later, after an exhausting morning of paddling and bickering, he approached the lakeside with the canoe on his head and instantly sunk in mud up to his knees. Less than a minute later, their dog ended up in the same spot up to her armpits and completely incapable of moving. We countered these lows with wildlife sightings (a mama and baby moose! ), campfire massages, and solid doses of bourbon and scotch. We sang the praises of the mosquitoes (whose reputation preceded them) for not making endless meals of us. We sang Billy Joel and the Beatles and tunes from our adolescence. We played cards, sheltered from thunderstorms, and drank the rainwater we collected. We read classics (Grapes of Wrath, White Fang) and survival pamphlets. And on the day we paddled out of the BWCA, we treated ourselves to a massive dose of beer, pizza, and ice cream, followed by an evening with the coolest couple I’ve met in years. See shamelessly cheap rain gear, 120 meals’ worth of food, caught fish, and the mama-baby moose in this album.